More than a year after the launch of Google Buzz, rumors have been tossed about on most tech news sites about just what Google has been up to in the world of social to ebb the flow of activity that has migrated to Facebook and to a lesser extent, Twitter, over the last few years. With users spending significant time participating in social activity on the Web, it's made Google sometimes seem like the last era's winner, with it being thought the future of discovery is through friends. So long as another company owned the social graph, Google has been pushed to an unfamiliar role, as challenger. With today's launch of Google Plus (nee Google+), you can see they haven't taken the role of backup lightly - delivering a fun and engaging place that brings many of the benefits of existing social sites, but learns from their mistakes. 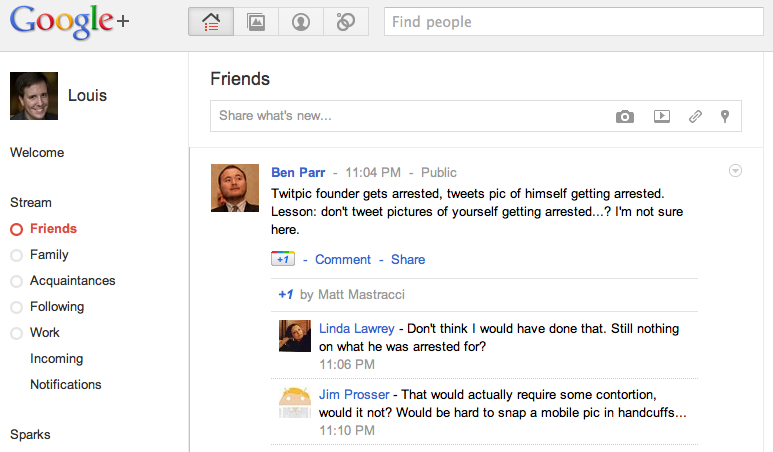 In time, the package of Google+ could be a serious alternative for people's attention. 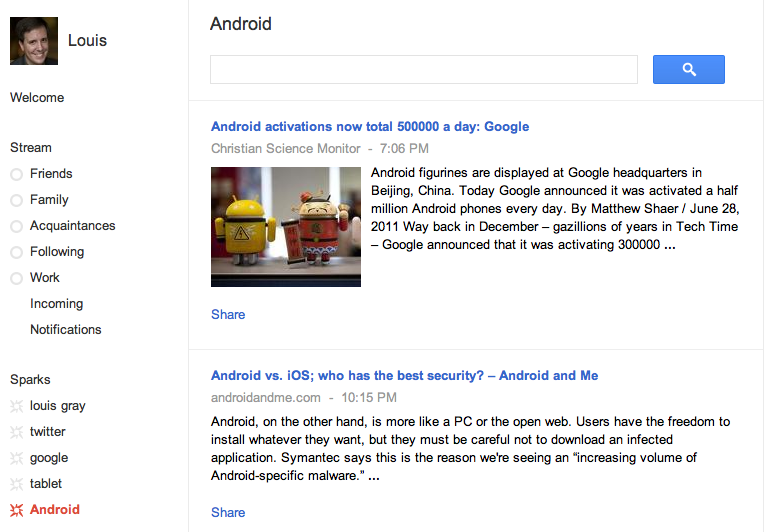 As a longtime Google ecosystem power user with Google Reader and Buzz, both of which I continue to use even as they've fallen in others' eyes, gaining access to Google+ today was practically second nature. Within minutes, I had started to reassemble a brand new social graph into explicit "Circles", their equivalent of lists, and could share status updates, links, and photos. The vast majority of content in Google+ feeds into a centralized stream of all friends' updates, with additional product features including built-in chat, powered by Google Talk, "Sparks", much like saved searches to surface interesting articles, "Hangouts" for instant video chats with other users, and at least on mobile, "Huddle" for group chat and instant photo uploading. 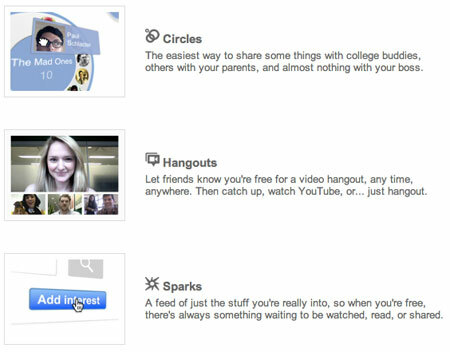 Circles, Hangouts and Sparks - All Part of Google+. Clearly, this is no small undertaking - one Google has thought through in the year since Buzz's launch and initial privacy hiccups, and one where they have given an unprecedented (for them) amount of effort in making sure the user experience was top notch. While we've grown accustomed to helping Google test out their first iterations of beta software, Google+ is well designed out of the box, and has seen positive kudos from all corners of the Web, so far as I can tell. There are bugs, of course, but nothing dramatic. Most of us power users on various social networks, from Facebook and Twitter to lesser successes, like FriendFeed, have been reticent to adopt lists for sharing out of our corpus of friends. FriendFeed and Twitter's lists have primarily been read-only, letting you organize what you consume, and Facebook's selective filters for sharing are underutilized and challenging. The Circles in Google+ are easy, backed by starting from scratch on the social graph for the most part, and being easy enough to drag and drop to new circles, complete with old-school rotary phone like animation. I managed to set up connections with more than 400 different people on Google+ today without getting carpal tunnel syndrome. I can choose to share each post of mine with the world, or a subset of folks in each Circle. The integration with Picasa and especially automatic uploading has increased the visibility and vitality of the photo service, which has similarly played second fiddle to sites like Flickr for the masses and hip apps like Instagram and Path for the geeks. Albums on Picasa are available for featuring in Google+, and photo sharing is quite simple. 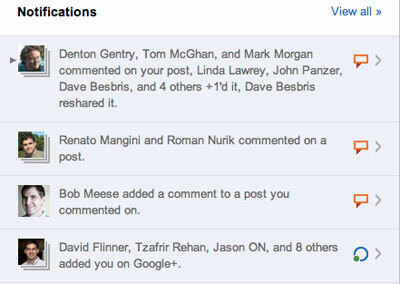 You can also tag any Google+ user on any photo, one of the major reasons Facebook Photos became so wildly popular - along with notifications that you'd been tagged. Speaking of notifications, they're nothing if not thorough. Thankfully, unlike other networks, you get follow notifications in bulk. After a certain amount of time (not exactly clear), you can get emails saying how many new people are now following your account. On the fun of day one, I got a handful with dozens apiece, rather than hundreds of separate emails. In the site itself, you can see a small number in a square highlighting the number of notifications that beg for your attention, including new connections, comments on your posts, whether someone has tagged you in Google+, or if comments have happened on a thread where you've commented. Of course, if you don't want an email or phone push notification each time that happens, you can just disable those in your settings, and reduce the amount of bacn in your life. Congrats! 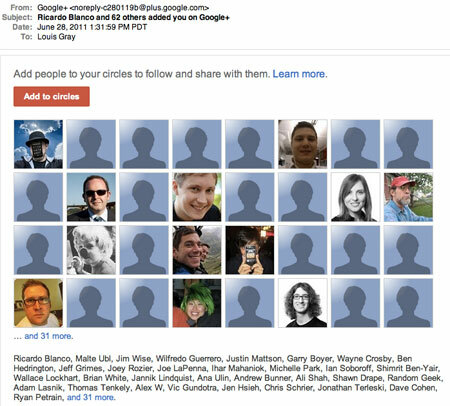 You're Followed On Google+ By Lots of People! The biggest and most exciting piece of newness with Google+ over Buzz for me, though the services are vastly different, is that Google broke out of the Gmail box on this one. While I understood the desire to automatically create one's friend graph in Gmail and embed it in a popular app, the mere act of having to head to Gmail every time I used Buzz was a real detractor for me. Google+ is its own dedicated URL and it looks great in every browser and mobile device I've tried before, even the Galaxy Tab 10 on Honeycomb. Right now the service is invite only, and I don't have any invites to spare - trust me, I'd pass them around like candy, because I think this is a service you just might want to enjoy. Google has invited some skepticism for false starts in the past, but from what I've seen today, especially the excitement and wholescale adoption of the launch from prominent Googlers, this time they are absolutely serious and we'll be seeing some noise from this team. Their URL is plus.google.com and you can find me here: https://profiles.google.com/louisgray/posts.